Fresh, crisp, light, and brightly-flavored aren’t terms that are used to describe winter food very often. But, this is a winter salad, and it’s all of those things. Those cute boxes of clementines in all the grocery stores had been calling out to me for weeks, and I finally brought one home. I haven’t yet decided how to use the remaining 50 or so clementines other than for snacking, but seven of them were delicious in this salad. 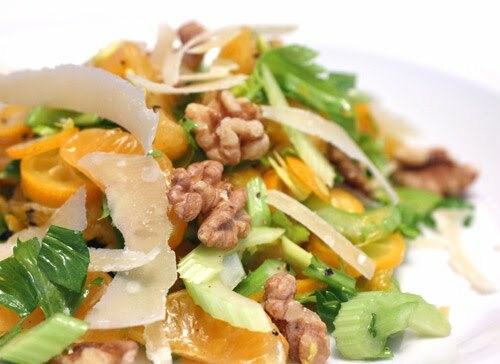 There are also kumquats, hence the name, celery slices, and crunchy walnuts. I found the recipe in Super Natural Cooking by Heidi Swanson. The clementines were peeled, and the segments were pulled apart. Celery stalks were thinly sliced on a diagonal. I really like celery leaves, and I tend to use the interior stalks with leaves intact for salads. So, the slices and chopped leaves joined the clementine segments in a large bowl. Then, ten kumquats were thinly sliced, seeds were scooted aside, and those slices joined the salad followed by toasted walnuts. A quick vinaigrette was made from lemon juice, olive oil, and salt and pepper. The vinaigrette was carefully mixed into the salad by hand so as to prevent the citrus pieces from breaking. Last, the plated salad was topped with parmesan shaved from a block of cheese. There’s nothing wrong with typical, slow-roasted and braised winter dishes, in fact there’s one I’m planning to mention soon, but this salad was a nice bit of freshness in the midst of this season. It was sweet, tart, nutty, and fruity all at the same time. As I served it, I thought it might also be nice on a bed of baby arugula leaves to add a peppery note, or fennel slices might be a lovely addition to it. I don’t mean to overcomplicate it though because the simplicity of its mix of flavors was great just as it was. 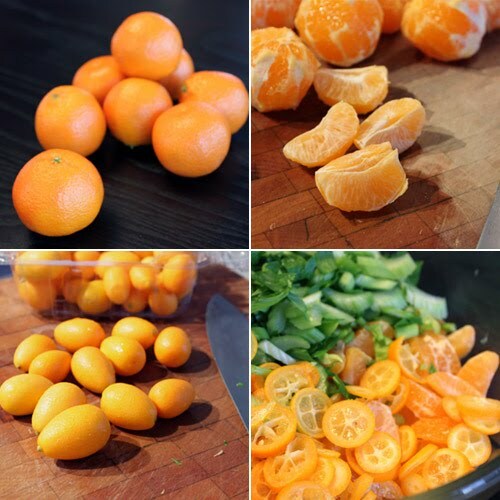 Citrus is my savior every winter! This salad is just what I need to get over my cold and my non stop soup and stew dinners! Your photos are so pretty! i love that book! 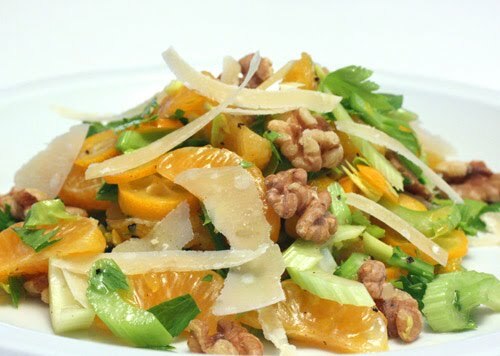 and this looks so wonderful and refreshing- i really like the combo of citrus and walnuts. reminds me of california. i will bookmark this one for sure! Outstanding colors, flavors and textures! I am now craving that salad! Lovely, delicious, citrusy, cheesy, nutty -- am I missing anything else? Oh and healthy. I love it. Oh, yes - his salad is a beautiful bit of sunny, freshness for the season! I've made yam som oh (Thai pomelo & prawn salad) and would love to make more citrus salads like this. It's not very 'local/seasonal' of me but I have to survive winter somehow! A beautiful and original salad! great choice of flavors! Sounds great to me. Although I don't really like oranges, I do like them in salads and I love clementines. This would go so nicely with Mexican food! A very pretty and refreshing salad! clememquat. i love it. excellent winter salad, lisa--it has every color, flavor, and texture one could want! Great refreshing salad that is also good for the throat! What a lovely elegant winter salad! I love the clementines and cumquats here! Beautiful, bright salad for the dark winter! That's such a great idea! Great flavours. I love the different textures and flavors of sweet, tart, and salty! Such a vibrant and refreshing salad for the middle of winter! Looks very tasty. I would have gone with "kumintine," but that's just me. Great looking salad packed with flavour and vitamins. Your salad name is such fun, Lisa! Clemenquat just about covers it! I adore winter salads... but yours is particularly fresh, crisp and colorful. Sometimes I add a little orange juice to my vinaigrettes when I am making a salad like this. I love this salad. Definitely my kind of salad!!! Celery is so underused in salads - I love the crunch of them. What a gorgeous and refreshing salad! I love clementines! That looks so beautiful. This is perfect for citrus season! Hi, I just re-tweeted your post. You have a really nice blog. Please connect with us on our social food & wine network @ http://www.tasteandshare.com and share links and posts from your blog.